I'm sure I'm dating myself here, but I have fond memories of the days when beaming data from one Palm Pilot to another was a mark of distinction for the geeky elite. While the Palm Pilot 1000 is now ancient history, quick mobile data sharing has transcended the echelons of nerd-dom with gesture based transfer services Bump and Hoccer. The concept is simple. When you want to share a file, recommend a song or an app, or give someone a contact from your address book, you both pull out your phones. Bump them together (or, with Hoccer, employ some more theatrical gestures) and the data zips onto their phone over the Internet. This should go without saying, but the gesture itself is just a trigger. The bumping or throwing does not actually transmit the file through local space from one device to another (yes, I've met people who asked about this), even though it may appear to have this magical effect. The services use your phone's GPS location to detect the proximity of the two phones running the app, and the accelerometer to detect the bumping or throwing/catching motions. Even in a crowded space where lots of people are running those apps, that data is enough to trigger the transfer of whatever data the sender has selected. Bump transfers files and other data with a fist-bump. Of the two services, Bump is by far the more established. It's available for iOS and Android, and readily transfers data between the two platforms. You can use it to share photos, music, contacts, and apps. The gesture is basic: Bump your phones together to establish a connection or send data. I should point out that bumping a paid app or music download does not actually give the recipient a free copy of the tune or app. For music, it takes them to a YouTube stream of the song, and for apps it will take them to the app store of market. It also includes the ability create a connection in person, and then later send files to that contact even if you're miles apart. 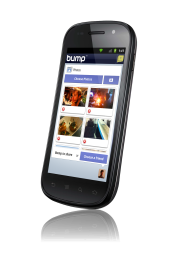 Bump develops on an iPhone-first basis, so as of this writing the iOS version includes the ability to share calendar entries and social network connections, while the Android version is still awaiting further updates to bring these features. The Hoccer Wall is supposed to let you throw images at a presentation screen, but in my tests it didn't work. Like Bump, Hoccer can share stuff between Android phone and iOS. It also includes a Web app so you can send stuff to your friends from your PC (no, you don't have to make a throwing gesture with your monitor). 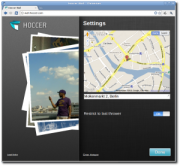 A newly launched feature called the Hoccer Wall lets you throw pictures onto a Web page on Hoccer's server, which has purported value in making presntations; unfortunately, this feature is very unreliable in my experience, and will probably make you look foolish if you try using it at your next keynote. I like the ideas behind Hoccer, but the service is too unreliable to be useful at the present time. My trial was plagued by connection problems, even over Wi-Fi, and many attempts to send data had to be repeated three or four times before successfully completing a transfer. The Hoccer Wall feature didn't work at all for me. If Hoccer's developers can iron out the reliability issues, this service could be a serious competitor to Bump. Otherwise, it's just a novel toy. For the productivity minded, gesture-based sharing is an awesome addition to the mobile toolkit. I think Bump is a must-have for its easy data sharing features, which have proven themselves for me repeatedly in business use over the last couple of years. The fact that it happens to also be fun to use may be just a coincidence.